Although New Hampshire is one of the smallest states in terms of size, the state is home to an impressive array of postsecondary educational opportunities. There are currently 17 private universities, seven community colleges, and five public four-year institutions. The state has a long history of providing top tier educations, with the Dartmouth College providing education since before the American Revolution. With so many options, students should have no trouble finding a school matched to their educational needs and future plans. 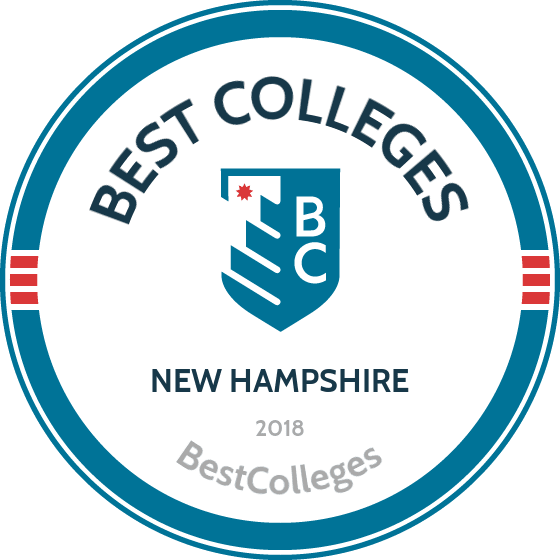 Fortunately, we have applied our rigorous methodology to the latest education data to rank the best colleges in New Hampshire, including the top four-year and two-year schools. Nearly 78,000 undergraduates are currently attending New Hampshire institutes, ranging from large public research institutions to small liberal arts colleges. As of 2014, research showed that the top four-year degrees were awarded in business, health professions, biological and biomedical studies, English language and literature, and education. Over two-thirds of baccalaureate students are enrolled in full-time studies, with the remainder undertaking their educations on a part-time basis. Regardless of the needs of an individual student, the four-year schools highlighted in this list are sure to check off their wants. A leading research college in New Hampshire and internationally, Dartmouth offers 57 majors and 1,000 independent studies in a variety of liberal arts disciplines. The college’s year-round customizable academic calendar of 10-week terms allows undergraduate students flexibility in study and more opportunities to engage in work experience or study abroad programs. In fact, off-campus programs at Dartmouth include over 40 options for studying other cultures. The Ivy League school is one of the best colleges in New Hampshire for students in the arts, declaring creativity to be “at the heart” of Dartmouth education. With several arts centers across campus -- including the Hood Museum of Art, which houses more than 70,000 works -- Dartmouth supports initiatives such as student-run arts groups, ensemble performances, and employment opportunities. The academic Arts & Sciences department offers 40 programs in arts and humanities, sciences, and social sciences, as well as interdisciplinary programs such as comparative literature and quantitative social science. Courses are taught by 408 industry-leading tenured and tenure-track faculty members. UNH Manchester is one of three campuses of UNH, the largest of New Hampshire colleges. Also located in the state’s largest city, this campus provides a vibrant student life, within walking distance of concerts, museums, and sporting events. On campus, students can take part in clubs, organizations, student committees, and athletics. UNH Manchester’s focus on career-driven programs and experiential learning means that students develop extensive preparation for their chosen field. Undergraduates can choose from 33 programs in over 50 areas of study, such as neuropsychology, computer science and entrepreneurship, homeland security, and American Sign Language. They can also benefit from learning in 16 cutting-edge labs and studios. The school is proactive in creating internship and career opportunities with resources such as Pathways Mentoring (a mentoring program that connects undergraduates with alumni), Wildcat Careers (the school’s own job listings website), and the Federal Work Study Program (FWS). Thomas More College, another four-year Roman Catholic institution, focuses on intensive study of scripture and its context in education. However, the school welcomes students of all faiths and backgrounds. The campus is located in Merrimack, conveniently located close to Boston and the Atlantic Seacoast. The small student body of 92 and its single undergraduate program offering (a bachelor of arts in liberal arts) makes Thomas More one of the most intimate colleges in New Hampshire. The tight-knit community is also diverse, currently coming from 27 states and two foreign countries. In studying the distinct liberal arts program, students are “prepared for life, not a narrow specialty”. They also have a one-of-a-kind opportunity to travel abroad: 100% of students opt to study in Rome for one semester, and others may study British history and literature in Oxford. Student life is designed to be as fun and refreshing as possible, with regular events such as banquets, poetry contests, bonfires, talent shows, and movie nights. UNH’s main campus, located in Durham, is one of the top in the nation for ocean research -- funded with more than $100 million externally -- and one of the best colleges in New Hampshire for those drawn to the outdoors. The campus offers hiking activities in the university-owned College Woods or Mendum’s Pond, and excursions to the nearby White Mountains and the Seacoast. UNH even has an outdoor education program, which is the only one in the country to offer bachelor’s degrees in kinesiology: outdoor education. In addition to this unique program, the Durham campus of UNH offers another 200-plus degrees across 11 schools. These include other distinct subject areas such as forest technology, justice studies, and ecogastronomy. Some of these programs can be taken in dual major format, integrating more than one field. The school enrolls around 13,000 undergraduate students from 70 countries each year. Located downtown in a 170-acre campus, Keene State is one of the most involved in the community among New Hampshire colleges. Students contribute 17,000 hours to community service projects each year, and are active within the college’s own community, too. Keene State offers undergraduate degrees in over 42 areas of study, including a chemistry program recognized for its quality by the American Chemical Society. The school also has student involvement programs for volunteer, leadership, and professional growth opportunities, plus over 100 student organizations to get involved in. Students can benefit from extensive veterans support and academic support services, and alumni are each offered three career advising appointments post-graduation. Saint Anselm is one of several Catholic liberal arts colleges in New Hampshire. Alumni have a high success rate, with 98% of 2015 graduates in full-time employment, continued education, or volunteering within six months of leaving the school. Saint Anselm offers 45 majors and 43 minors -- as well as pre-professional programs -- in engineering, dentistry, law, medicine, and theology. The average class size is 18 and courses are taught by top researchers in social and physical sciences. All freshmen participate in “Conversatio”, a core humanities program that introduces students to studying the liberal arts through the Catholic Benedictine intellectual tradition. Saint Anselm also encourages service learning and volunteering participation. Students can engage in some of the many extracurricular activities on campus; athletics are at the center of campus life, with 83% of students involved. Saint Anselm has 20 intercollegiate teams, including a ski team that qualifies for the United States Collegiate Ski and Snowboard Association (USCSA) Eastern Regional Championship this year. Located in central New Hampshire, Plymouth State’s 170-acre campus houses 4,300 undergraduate students and state-of-the-art facilities. The school offers a student-focused learning environment with a unique integrated cluster approach, giving students opportunities to collaborate with partnering organizations and design their degree program according to their individual aspirations. In any case, Plymouth State’s undergraduate degree programs -- in subjects ranging from adventure education to finance -- offer a comprehensive foundation in liberal arts. Plymouth State is one of the best New Hampshire colleges for campus involvement. The school prides itself on its “friendly, hometown vibe”, with frequent activities happening around the school. The Career Services center helps students plan their involvement with clubs and organizations, as well as resume building, internships, and career searching. It is well suited to students who enjoy outdoor activities, for its proximity to the White Mountain National Forest and Lakes Region. Rivier University is a Catholic, co-educational college located in Nashua. It is the only school among New Hampshire colleges to offer the Employment Promise Program, which guarantees employment within nine months of graduation or the provision of financial and educational support. Rivier emphasizes that the program is marked by the distinctiveness of its 50-plus academic programs in liberal arts/sciences and professional studies. The undergraduate day programs are taught alongside a core curriculum which explores ideas such as faith, ethics, justice, and global responsibility. Courses are offered in online and hybrid formats, as well as on-campus, and are fully accredited by the New England Association of Schools and Colleges (NEASC). Rivier has a thriving athletic community; its teams compete in the NCAA Division III and are a member of the Great Northeast Athletic Conference (GNAC). Students have access to a range of resources to support their academic and recreational endeavors, such as the Multicultural Office, Counseling Center, Career Development Center, and Campus Ministry. Focused solely on creative programs, New Hampshire Institute of Art is the oldest and largest among art colleges in New Hampshire, established in 1898 to provide progressive, educational instruction. The institute is located in Manchester, near noted art hubs such as Boston, Portland, and Portsmouth. NHIA also partners with the University of New Hampshire at Manchester, bringing students together with like-minded interests and perspectives. Prospective students have the option to enroll in the school’s two-week Pre-College Art Intensive program to ensure NHIA is a good fit, begin building a portfolio of work, and explore career possibilities. NHIA offers bachelor of fine arts (BFA) programs in eight studio arts and writing subjects: ceramics, creative writing, fine art, foundations, design, illustration, liberal arts and sciences, and photography. In addition, students can select the BFA and MA in visual arts, a dual degree that allows undergrads to add on a one-year master’s in teaching visual arts. Colby-Sawyer College is a liberal arts and sciences college dedicated to combining academic, co-curricular, social, and athletic experiences into a cohesive education. Student success is a top priority of the school, which is reflected in the fact that 100% of students gain pre-professional experience during undergraduate study. Creating learning portfolios is also a core part of the curriculum, allowing students to demonstrate their achievements. All programs conclude with a Capstone project. There are 19 majors and 25 minors to choose from in fine and performing arts, humanities, literature, science, social sciences, and history. In their first semester, students choose a First-Year Symposium to help develop strong study habits. They are also able to study abroad in their final year. Currently, there are 1,020 undergraduates enrolled: 70% women and 30% men. Colby-Sawyer has one of the most scenic campuses among New Hampshire colleges, with beautiful views of mountains, forests, and lakes 90 minutes from Boston and 3.5 hours from Montreal. The Community College System of New Hampshire oversees the seven community colleges operating through the state. With a tuition rate of $200 per academic credit for in-state students, thousands of residents and out-of-state students currently take advantage of this option. In addition, all seven two-year institutions offer a dual enrollment program, allowing students to receive automatic admittance to the University of New Hampshire system, provided they meet certain academic requirements. Manchester was established in 1945 to provide educational opportunities to returning veterans. The institution offers more than 60 associate degrees and certificates to approximately 2,900 students on-campus and about 1,200 online. The five most popular programs are liberal arts, business, automotive/Etech/HVAC/welding, healthcare and wellness, and computer science. Manchester offers students a flexible and rigorous education at an affordable price. One notable program is the school’s AS in computer science and innovation, which focuses on workplace and consumer applications, including programming and networking for mobile devices and household appliances. The AS in technical studies allows students to choose technical electives to complement their professional area of technical expertise, certification, and/or training. MCC is one of several New Hampshire community colleges with articulation agreements with four-year colleges. Campus life includes approximately 30 clubs and organizations and MCC’s signature Alternative Break Trips, where students can volunteer in countries around the globe. Located at the base of the Presidential Range in White Mountains, WMCC is one of seven public community colleges in New Hampshire. White Mountains offers associate degrees, certificates, and job training opportunities in Berlin and at an academic center in Littleton. Associate degree programs are offered in liberal arts, accounting, information technology, and health and wellness; popular certificate programs include nursing and culinary arts. New Hampshire’s environment is the classroom for students in the associate in science in environmental resources program, with a focus on environmental science. Another notable program is the associate in science degree in criminal justice/homeland security, which includes courses on correction, the courts, and law enforcement. White Mountains has a transfer agreement with the University of New Hampshire, Keene State College, Plymouth State University, and Granite State College, which allows students to easily transfer their credits to these schools. Support services for distance learners include advising and tutoring. NHTI-Concord has approximately 4,500 students in south central New Hampshire. NHTI-Concord’s curriculum includes 41 associate degree programs in disciplines such as business, education, engineering, and liberal arts. NHTI, one of the best community colleges in New Hampshire, has a dual-admissions agreement with the University of New Hampshire-Manchester for graduates with associate degrees in technical fields to automatically earn credits toward a bachelor’s degree in engineering technology. NHTI has established a robotics and automation engineering technology program funded by a federal grant. NHTI-Concord offers a variety of services to students, ranging from placement and tutoring to disability services. Transfer students have a number of resources available to help facilitate a seamless transition to a four-year institution. Campus life includes access to more than 30 student organizations, 11 intercollegiate teams, and many opportunities for service learning and community service. Nashua’s mission is to provide residents in the Nashua Region with a post-secondary education that addresses the diverse needs of the local community. Instilling students with the academic and technical skills needed for career success, the school works to empower them with essential skills -- including critical thinking, information literacy, and ethical responsibility. Nashua, one of the best community colleges in New Hampshire, offers more than 30 associate degree programs in various disciplines, including the arts, humanities, communication and design, business, industry and transportation, STEM, and manufacturing. The AS in business administration has four concentrations: accounting, management, marketing, and small business entrepreneurship. The associate degree in liberal arts has two concentrations: math and biology. NCC’s Early College allows high school students to earn college credits while attending classes at NCC. Among student resources are career services and state-of-the-art equipment and computer labs. Many students enjoy meeting up at the school’s Cafe 505. Great Bay Community College operates campuses in Portsmouth and Rochester. Through its many programs, students acquire the skills to enter the workforce or transfer into bachelor's programs. The school offers associate degrees in accounting, American studies, business administration, education, and criminal justice. Great Bay, one of the top community colleges in New Hampshire, also offers several associate degrees in the sciences, including chemistry, biotechnology, bioengineering, and biological sciences. Students pursuing careers as data scientists can earn an AS in analytics, a two-year program designed for transfer to a four-year college. Graduates acquire skills in math, computer programming, and data analytics to begin a new career. The associate degree in technical studies allows students who already have technical expertise to design a plan of study using a comprehensive suite of electives. Students at Green Bay enjoy comprehensive support services, including tutoring, transfer support, and career guidance. If you're thinking about applying to one of the best colleges in New Hampshire, continuing reading to learn more about living in the Granite State.